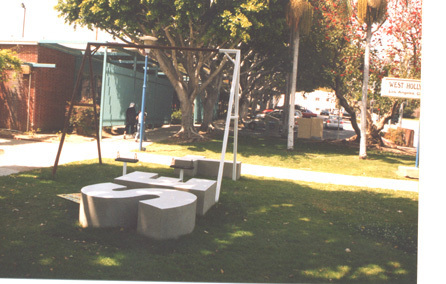 Temporary installation at 647 San Vicente Blvd, west of the Pacific Design Center, March-June 2003. Set/Seat is a large sculpture comprising several components: large concrete cast letters S, E and T that lie on the ground with the letter A created as a steel frame perpendicular to the other elements. The sculpture incorporates a seating component, witty word play, and a strong evocation of childhood memories, elements that are present throughout the artist's work. Information about the works has been gleaned from the Art on the Outside press release. Photograph by Ruth Wallach, taken in June, 2003.